Rowan County Crosby Scholars, through the support of donors and community partners, awarded 138 graduates a $1,000 Last Dollar Grant to help finance their college education. Ethan Diaz, Elizabeth Haff, Logan Ridenhour and Paige Sloop, Appalachian State University. Mikayla Lambeth, Cabarrus College of Health Sciences. Will Anthony, Irma Begic, Andrea Garrido-Lecca, Darreon Gittens, Trilby Kirk, Drew Kisamore, Henderson Lentz, Autumn McGee, Katelyn Nesbitt, Jodi Nesbitt, McKenzie Upright, Lyshet Valencia and Tiffany Vang, Catawba College. Dominque Karczewski, Coastal Carolina University. Mackenzie Stall, College of Charleston. Jailene Aguilar, Graham Bowes, Clarence Brownell, Joseph Dufour, Keshone Evans, Madi Fuller, Donté Hill, Alicia Kincaid, Chandler Lippard, East Carolina University. Marvin Scruggs and Rylie Stewart, Greensboro College. Tessa Nicolosi, Guilford Technical Community College. Micah Helms, Brandon Kimberlin, Mackenzie Reid, High Point University. Jessica Eagle, Mitchell Community College. Bailey Graham and Cierra Hunter, Montreat College. Jibri Cowan, Shanadia Cowan, Keke Daniels, Quan Jackson, N.C. A&T State University. Taelor Davis and Shanice Miller, N.C. Central University. Tristyn Flowers, Devin Gay, Mercy Kreul, Bekah Lippard, Mikayla Mather, Baily Rayfield, Cameron Rayfield, Garrison Seitz, N.C. State University. Elizabeth Medina-Diaz, Ohio State University. Jonathan Brindle Jr., Marissa Meadors, Ivy Rabon, Kayla Smith, Bri White, Matthew Zucchero, Pfeiffer University. Emma Cooler, Daniel Garcia-Lopez, Queens University. Lindsey Cox, Christian Deneen, Mcgwire Smith, Khalil Vinson, Maddie Woodward, Rowan-Cabarrus Community College. Bethany Raynes, University of North Carolina at Asheville. Alex Burnham, Keegan Dillon, Makayla Dillon, Alex Ho, Susannah Horton, Amanda Patton, Lunar Singsomphone, Timmy Wilmot, University of North Carolina at Chapel Hill. 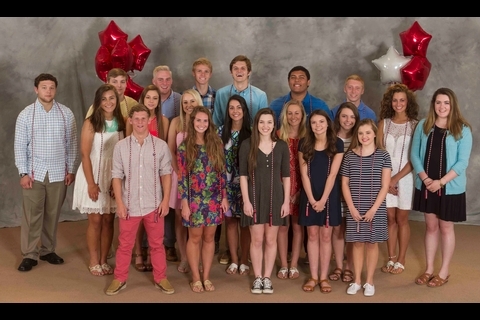 Aunika Allen, Kendré Bates, Allyson Baxter, Kelsey Borras, Dante Cataldo, Connor Childers, Nicole Cook, Anna Cox, Andrew Eller, Lydia Isaacs, Kalea Kennedy, Kaitlyn McCombs, Miguel Miller, Dillon Minehart, Angelina Palacios, Radha Patel, Ethan Rhodes, Jon Ritchey, Conrad Shugart, Elizabeth Thao, University of North Carolina at Charlotte. Dhasan Boler, Taylor Ellis, Miyahka Farris, Madison Full, Zach Hamm, Katie Howard, Julissa Pineda-tinajero, Jesus Sanchez, Deedee Woazeah, University of North Carolina at Greensboro. Madison Humphries, University of North Carolina at Pembroke. Julianna Cox, Hailey Overcash, Kaya Peele, Elena Turnbull, Hanna Venable, University of North Carolina at Wilmington. Taylor Wiggins and Robert Yount, Wake Forest University. Gisselle Anaya-Castillo, Evelyn Benitez-Repreza, Morgan Brown, Megan Driver, Eileen Nguyen, Levi Peterson, Alexis Witt, Daniel Woomer, Western Carolina University. Joe Brooks, Megan Huffman, Bryson Pope, Wingate University. Janae Bates, Jaylen Brown, Briana Dummett, Amarriya Harris, Khalil Oglesby, TJ Warren IV, Winston-Salem State University.